Some have defended Giuliani, saying that he meant truth is subjective. Everyone sees truth differently, including the events when Trump Jr met with a Russian to get dirt on Hillary Clinton. In an odd way, my fellow progressives can make similar statements about the truth. “Truth is relative.” On one hand, I sympathize with this view. After all, no one has a full grasp on the truth. No one owns the truth, and so any truth claim should be made with some humility. But we can’t avoid making objective truth claims. Even the statement that “truth is relative” is an objective truth claim about the nature of truth. Is it objectively true that truth is relative? If you believe that’s true, then you believe a truth claim about truth. 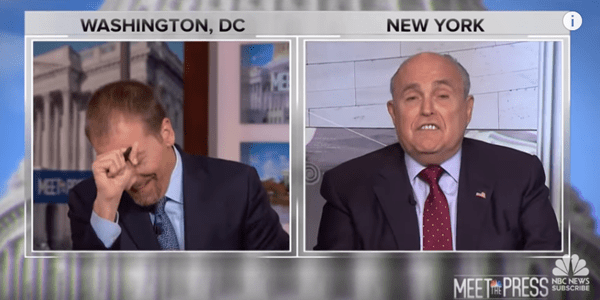 Giuliani’s claim that “truth isn’t truth” has the same confusing problem. Is it true that truth isn’t true? If so, then it’s true that truth isn’t true. If this is the case, American culture is falling down the rabbit hole of mythical chaos and confusion the likes of which Lewis Carrol couldn’t make up. It’s time for us to crawl our way out of the rabbit hole. Because the truth is that Rudy Giuliani and Donald Trump are either delusional and really believe their claims, or they are fabricators of truth trying to confuse the masses so that we no longer believe in the truth. Unfortunately, the truth is that our situation is more severe than Giuliani and Trump. We can’t just blame them. In a sense, we’re all delusional when it comes to the truth, and we can all be fabricators of the truth. René Girard, the great anthropologist of the 20th century, helps us understand why this is the case. Girard takes us back to the very foundation of human culture. Examining the anthropological evidence, Girard discovered that the truth was sacrificed during at the beginning of human history. He claims that the ancient hominids were ravaged by communal violence because of mimesis. What distinguished our ancestors (and us!) from other animals was their capacity for imitating one another. This imitation, what Girard called “mimesis,” was a non-conscious mechanism that helped hominids learn at a faster rate than any other species. They learned how to make tools and where to find the watering hole and many other things through the process of mimesis. But, and here’s the problem, they also learned what to desire from one another. They began to desire the same objects and the same social positions in their group. But what happens when they refused to share those objects and social positions? A fight broke out and soon the group was destroyed in a war of all against all. Over a long period of time, something happened that allowed these ancient groups to survive. Amid the war of all against all, an individual pointed their finger against another. Soon, others imitated the accusation and pointed their fingers against the same individual. The war of all against all became a war of all against one. The one, whom Girard calls a scapegoat, was blamed for all the problems that threatened the community. The scapegoat was unanimously sacrificed by the group. This unanimity brought a temporary sense of peace and cooperation, but the problem that mimesis engendered were never dealt with, so conflicts re-emerged. And when they did, another victim was found and sacrificed, giving a sense of temporary peace. Girard insists that mimesis, including the mimesis that leads a group to unite against a victim, is non-conscious. It’s more like a mechanism than a conscious act. As it turns out, the scapegoat was not the only thing sacrificed at the beginning of human culture. The truth was also sacrificed. Giuliani and Trump are involved in a mythical cover up that will be revealed over time. And on one level, I can’t blame them. For we have been covering up the truth from the very beginning of human history. The truth that sets us free is the realization that in some sense we are all caught up in some mythical narrative where “truth isn’t truth.” But Jesus invites us beyond that mythical narrative so that we can start telling that truth about ourselves and about our scapegoats. Only when we drop the finger of accusation against others can our eyes be opened to the lies that we tell about ourselves and about our scapegoats. Once we take ownership of those lies, we can take responsibility to tell the truth about how we have been caught up in mythical narratives. And once we tell that truth about ourselves, we will begin the process of being set free. Image: Rudy Giuliani on “Meet the Press.” Screenshot from YouTube. This led me to trace the source of the quote, “The first victim of war is Truth.” Which took me back as far as Samuel Johnson. (See link below) though I wouldn’t be at all surprised if similar observations could be found further back and in different cultures. And there seems a larger issue tied to the origin of the scapegoating process in specific instances. It often seems that manipulative individuals are quite willing to deny, at least to themselves, the value of truth. Their lies, fabricated for their own benefit, become the catalyst for a long-lasting and widespread lies clung to by others. Recreating the Wilderness Two People Fell In Love. And The World Is A Better Place For It.